We’re on a road to nowhere… – Don't make me turn this van around! At the end our last update, we were ready to set up camp like John Muir and weather the winter above Half Dome. But in the real world, friends were expecting us in Oregon, so we had to leave our forest of granite and lodge-pole pines. 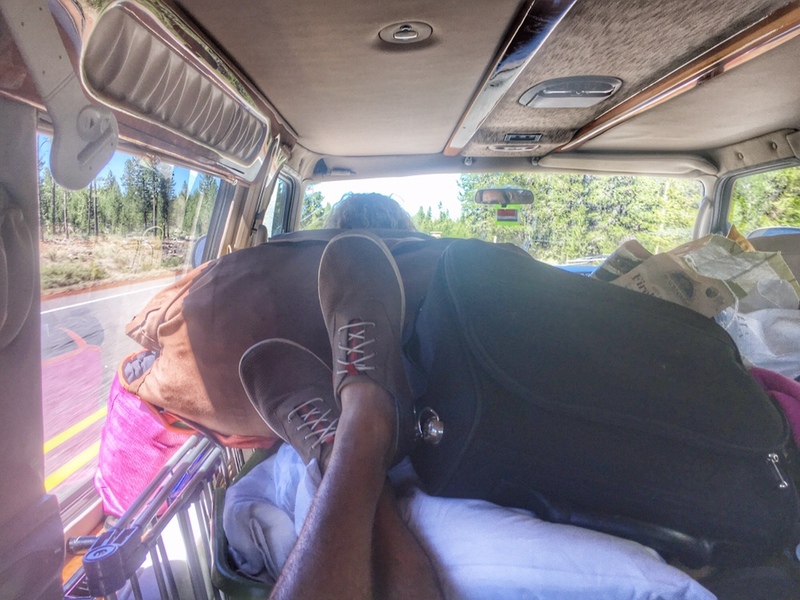 After five nights in Yosemite, everything smelled like a campfire, none of our clothes were clean, the van was covered inside and out with a fine dusting of green pollen, and our stuff seemed to have doubled in cubic volume. But spirits were high. We’d been in each other’s constant company for well over a month, but Yosemite seemed to wash aside the frustrations of daily family life. I swear I saw the kids hug, unprompted. The Pacific Northwest beckoned. With no cell service we studied the map trying to decide how to make it to our next destination: Hood River, Oregon, where we would visit close friends who have retired and spend half the year there. The trusty atlas revealed many ways to get there… but none of them involved passing through many towns. Gas, food and lodging were lacking. We thought there wasn’t much happening in that lonely land. We soon found out how wrong we were. Not even an hour outside of Yosemite, we came to the little town of Bridgeport. I remembered the name Bridgeport, from my early childhood, as an outpost of family camping trips. Leaving town, we turned to the west when something caught our eyes. 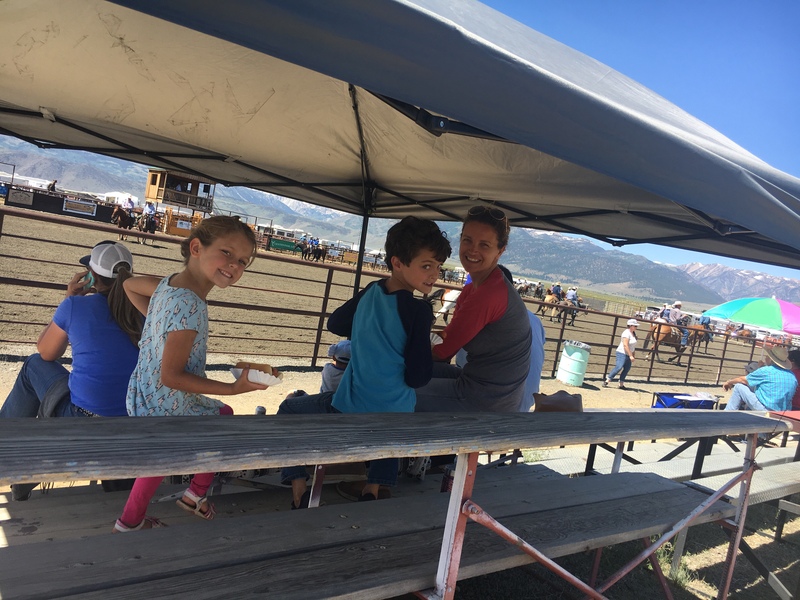 With jagged snowcapped peaks in the background, there as a hive of activity, with horses, cattle, riders in all shades of denim, and the smell of food cooking over an open fire. The sign said, “Rodeo.” And it was about to start. I quickly parked on the side of the road. We approached the gate apprehensively, not sure if this was truly open to the public, and quickly learned that we were thirty minutes early for the opening ceremonies. We paid a $10 admission and found a spot on the bleachers beneath the shade of someone’s portable canopy. Cowboys and cowgirls circled in the rodeo “ring” (if that’s what it’s called) warming up for the big day. This wasn’t a touring show, it was locals doing what they do. Family of one of the riders shared their shade with us. Eventually, our son made himself a spot in the dirt by the fence so he could better observe these mythic men. 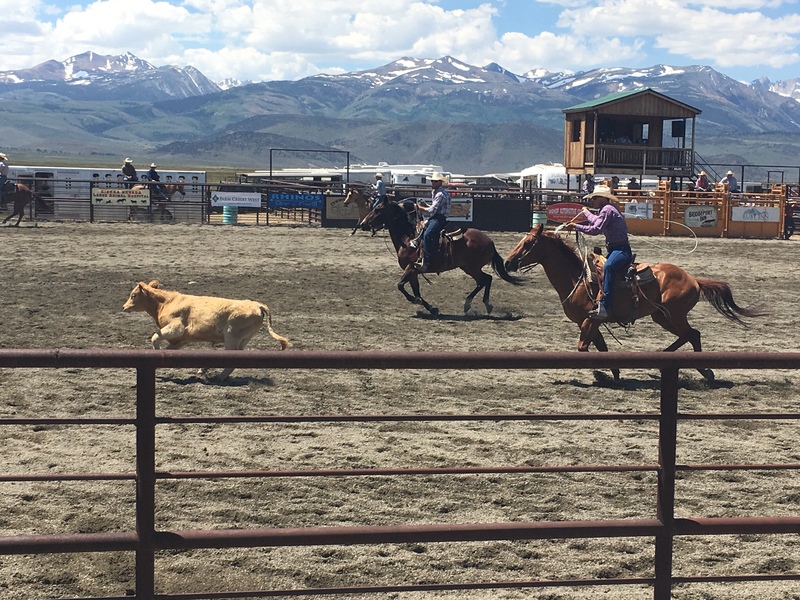 Soon, calves were running and lassos were flying. The West is alive in Eastern California. What I expected to be a thirty minute amusement became two hours of raw old-time American culture. 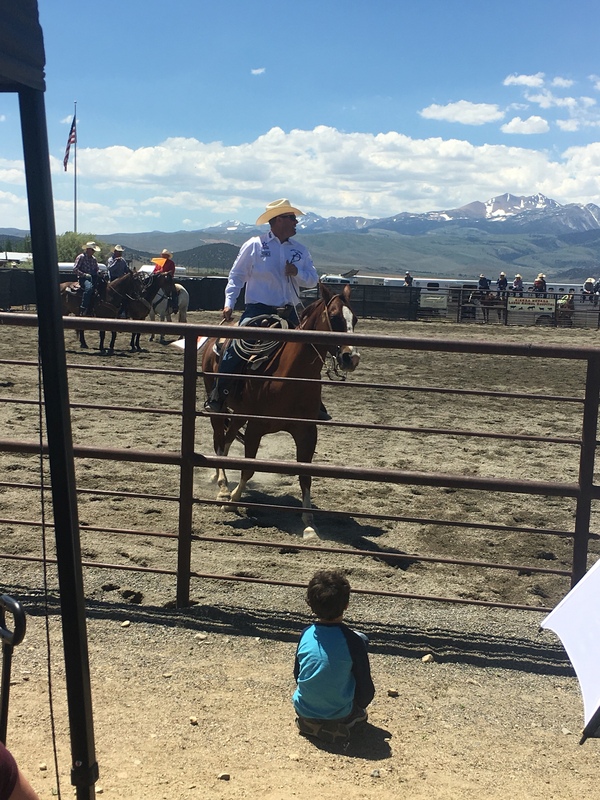 From the cheesy Lee Greenwood song playing over the tinny loudspeaker to the earnest tip of the hat from a 13 year-old roper competing among men, it was the kind of experience you cannot plan for. We drank it up and didn’t want to leave. Pictures never do justice to anything we do, but these shots seriously short-change the stunning setting of this event. 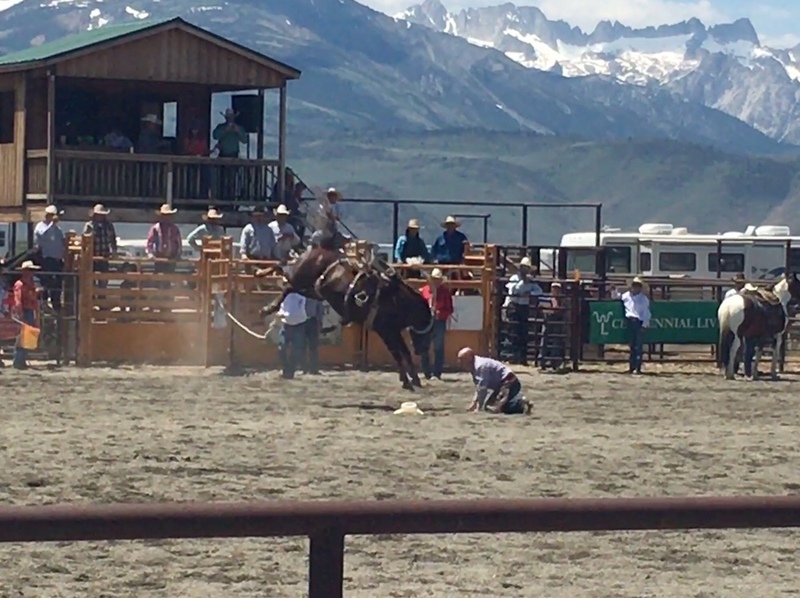 The knife-edged peaks cutting the horizon, the flying dirt, the deft riding a rope-work. It touched every sense in a new way. But we had to cover some ground. Our stop in Bridgeport complicated our prospects for overnight accommodations. 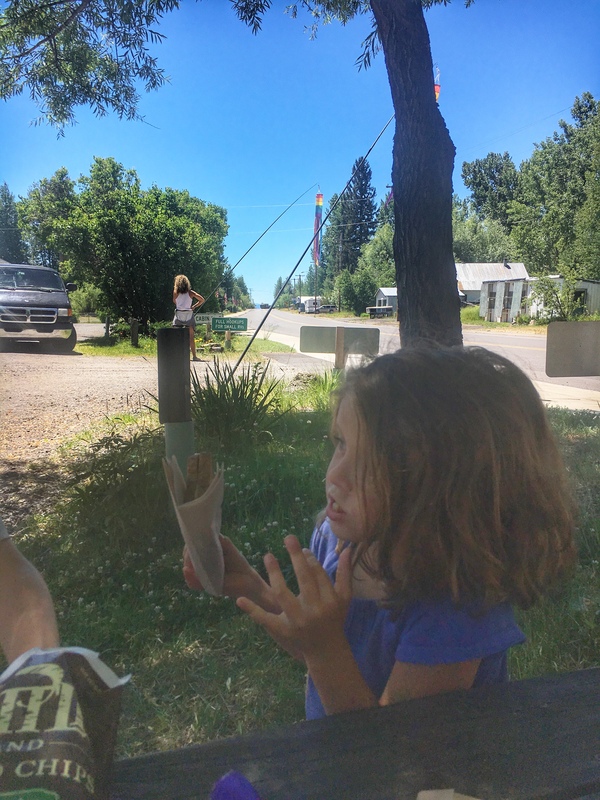 We grabbed some barbecue in the next town and realized that we were never going to make it to Klamath Falls, Oregon, where hotels are abundant. What we did have were miles and miles of National Forest where we could stop, but we were dying for showers. The only hope lay in the little town of Alturas, CA. We approached from the south, after a drive in which the last 70 miles has nothing… not even the remnants of a gas station. Northeast California in an endless stretch of beautiful mountains, high desert country, and reflecting lakes. According to the spotty data we could gather, Alturas offered several motels with unbranded, nebulous names like Rim Rock Motel and Trailside Inn. It also boasted a Subway, which have multiplied like Family Dollar, cropping up on every corner of unincorporated America. We arrived early in the evening and cruised the town doing a little recon. One hotel bragged dubiously of a “fine dining” establishment. Being Sunday night, I wasn’t surprised to find the restaurant closed – but it looked like it had never been open. In fact, the whole building was deserted and locked. A boy pushing a mop, we’ll call him Norman Bates, opened the door and admitted that there was, in fact, a hotel on the premises, but we had to call the after-hours number (it was 6:45 pm). He apologized that it was all “a bit weird.” Yeah. We decided not to stay here. We didn’t want to upset Mother. We pressed on and stopped at the only sign of life in town – Antonio’s Italian Restaurant – bursting with customers on Sunday night. I’m not lying – it was the best restaurant meal of the trip so far. We had a white pizza covered in mushrooms, peppers, onions and other veggies that they could charge $45 for in Manhattan. After dinner, we found The Trailside Inn which was a former Best Western. It’s always a little worrisome when a middling hotel brand removes their name from a property. But the Trailside turned out to be newly remodeled, comfortable, and served a decent free breakfast (aka $20 – 40 savings over hitting a restaurant). 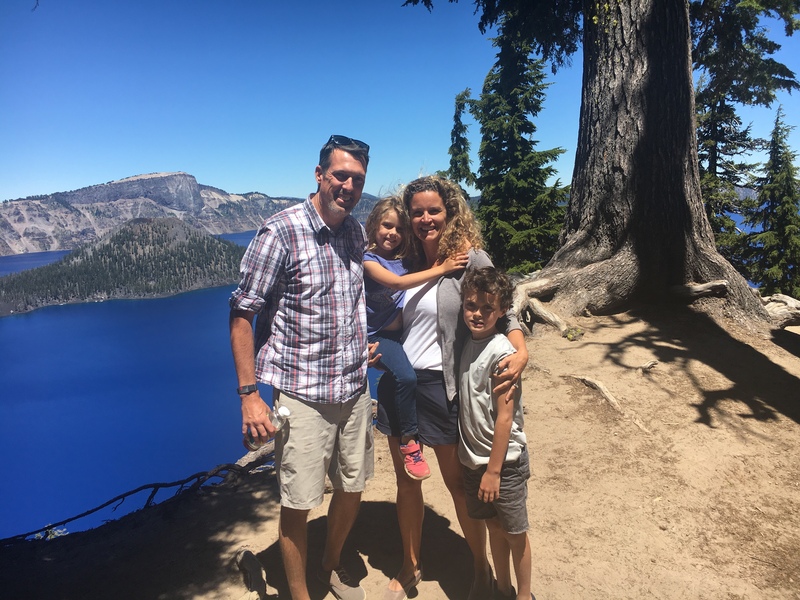 The next day was supposed to be a straight shot to Hood River, but we got ourselves sidetracked by Crater Lake – honestly, one of the most beautiful things to look at on earth. On the way there, Monica fretted about cell service because she had an important call to make at noon for a volunteer project back home in St. Petersburg. So while she made her call, we stopped at the only business in Ft. Klamath, Oregon – an organic grocery, motel, campground. We ate hearty grilled cheese sandwiches, washed down by local kombucha. It doesn’t get any more “Oregon” than that. I could make an argument for making the entire state of Oregon a National Park. Crater Lake has to be seen to be believed. 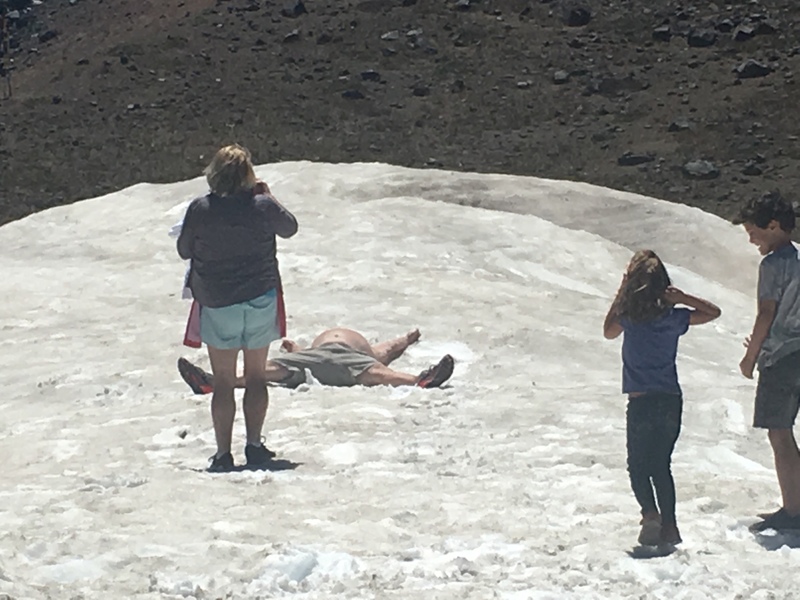 There was still enough snow near the crater’s edge in July for “that guy” to do snow angels. “How far does this road take us from the town of Antelope?” I asked. “Already checking on it,” Monica replied, already with her nose against the page. Why Antelope? I’m so glad you asked. Antelope, Oregon, is the site of a fascinating battle in the 1980s between the residents of the small town and a cult leader from India who’d chosen the area for his massive commune. Yes, in the early 1980s, the Rajneesh (aka Osho, aka Bhagwan, he went by many names) bought up a huge ranch and began bringing in thousands of followers, clad in shades of red and magenta. It is the subject of a recent documentary, Wild Wild Country, on Netflix or Amazon (I forget). Most people I’ve talked to have no recollection of this pre-24-hour-news circus. When I was a kid, we’d passed through the area and I remember my dad mentioning it. It’s utterly fascinating. We did finish our ride to Hood River coming up the Columbia River Gorge from the east – a beautiful driver along the famous river. I got to spend a little time in the back seat with our daughter (my first car-nap of the trip!). Every single inch of Oregon is interesting. 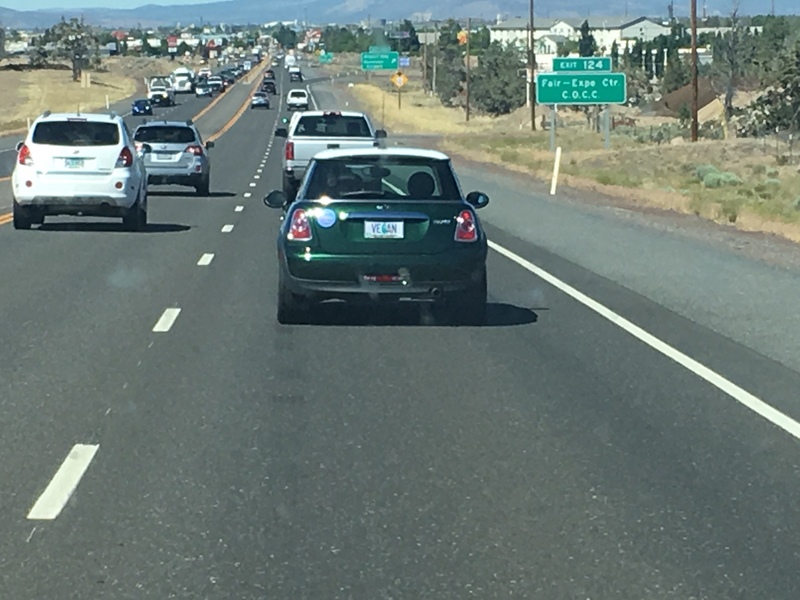 Top left: Yes, that’s a Mini Cooper with an Oregon plate that says VEGAN. Just in case you were going to try and stuff a burger in his mouth. Bottom left and right: I got comfortable in the back. 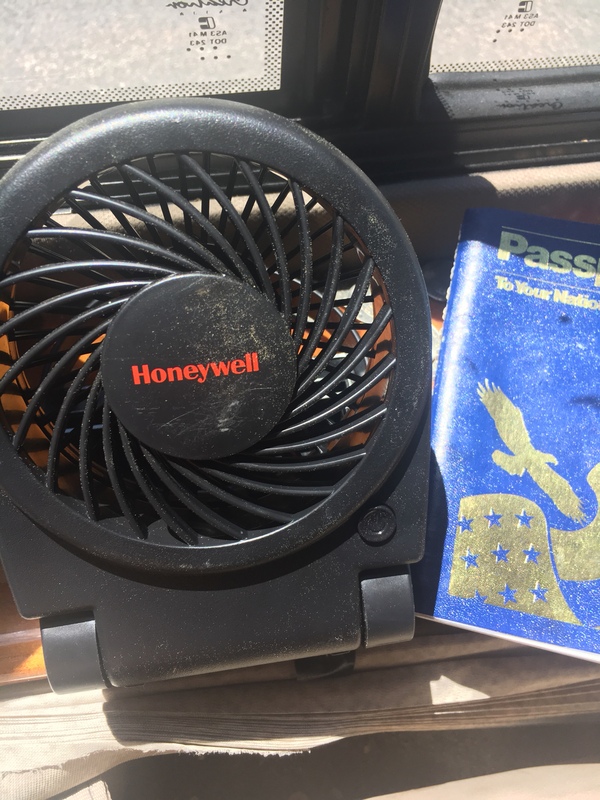 Placed a portable fan to enhance the rear AC, and took a nice nap. If you go. Like you’re ever going to drive from Yosemite to Hood River. Ok, if you do go, stay at the Niles Hotel in Alturas and report back to me.